Melissa Dieter came to Woodhouse from Queen Elizabeth’s Girls’ School and lives in High Barnet. 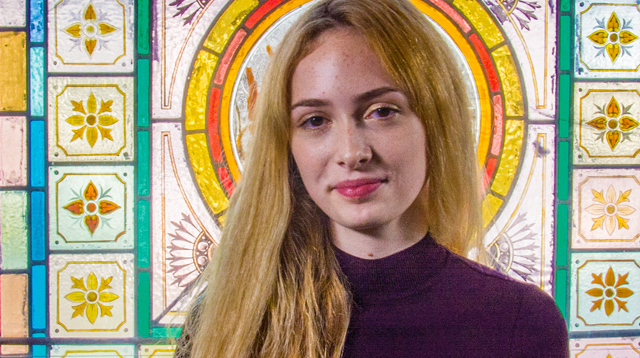 She studied religious studies, classical civilisation, drama and theatre and English literature at A level and graduated in 2018 with A*AAA. She is currently at York University studying English. “What interests me in religious studies is the idea of debate and the big philosophical questions like ‘Does god exist?’ and ‘Who created us?’. At A level there’s a lot more freedom of interpretation and we get to look at the scholars more deeply. It’s been quite a smooth transition. You are not as spoon-fed as you are at GCSE but then that gives you the freedom to go and do independent research and come back and discuss your ideas together, in the classroom. I thought of staying at school, but when I saw that Woodhouse use the Edexcel exam board I thought it had more open topics like Christianity, philosophy and religion, and ethics. I quite liked having that range of different stuff. I always thought about coming to Woodhouse as I‘d heard it was nice and inclusive - and a ‘next step’ toward university. I’ve really enjoyed it here -it’s gone too quickly. A typical RS class? Sometimes we start with a PowerPoint, perhaps about a certain scholar, and there will be a question like ‘Is euthanasia wrong?’ and we’ll have a class discussion bringing in different interpretations and looking at different religions. Sometimes we have quizzes to make sure we are all on top of the work, as well as tests on key answer questions. We’ll go through the structure of essays, which helps for writing essays in the exam. There’s a lot of class discussion and everybody gets to put forward their ideas. Sometimes we have a chance to prepare and have to be on a certain side, with views that we might not agree with. But it’s good to get two different perspectives, it helps you think more roundly, instead of just being on your own path. We do a lot of reading around our subject, making sure we know the argument and how it is structured, and there’s always a chance to go over it in class if we didn’t understand and we can stay for subject tutorials to make sure we have a strong foundation. There’s a real mixture of religions among the students and quite a few atheists, though I think most are agnostic. I think it’s good because everyone is open to each other’s ideas and allowed their own point of view. We get a lot of support from staff. We have a google classroom independent research page, where teachers post up interesting PowerPoints that students and staff have found or websites that have given them a good foundation for an argument. Everyone shares resources. Outside of RS, I took an extracurricular poetry class where we discussed and gave our own interpretations of poems. I also did some work experience at a law firm and small shipping company – they taught me some foundations of shipping law like the Gencon charter and time charter, which was interesting and a really good experience. Plus, a couple of us got chosen to go to Cambridge University for a philosophy talk about religious language which was useful. Religious studies ties in well with English literature which I want to study at uni. It helps you to form arguments and different analytical reasoning.There’s no right answer, you have to be open and think critically. I’ve applied to Cambridge, Bristol, Exeter, York and Manchester Universities. Before Woodhouse, I didn’t ever think I’d apply to Cambridge at all, but it’s so supportive here that I thought ‘why not go for it?’.